Wakame seaweed is a strong flavored, edible, algae popularly featuring in South Korea, Japan and Chinese cuisine. It is a kind of brown algae, similar to nori and kombu but turns green once processed. Scientific name: Undaria pinnatifida, Family: Alariaceae. Like other Phaeophyceae class of marine seaweeds, wakame too composes pigment fucoxanthin, which is responsible for the distinctive greenish-brown hue. Wakame grows in inter-tidal cold waters of Northern hemisphere oceans at a depth of 3-10 meters. Republic of Korea and China are the chief commercial producers of this seaweed. Mature stage wakame features sporophyll consisting of holdfast, strap-like midrib, and commercially important; fern-like leaf blades. Like other Porphyra species, wakame is cultivated in seaweed farms where shore emerges above sea water during low tides, and submerges under the water at high tides. The ropes arranged in the ocean in such a way that they are allowed come out of water and expose to air for a few hours a day. The Porphyra spores germinate on the ropes and grow into new thallus (blade). After harvesting, wakame leaf blades are blanched in hot water for a few seconds, which are then mixed thoroughly with salt. The salted leaf blades are packed in bags and pressed with heavy objects overnight to remove the excess salt water. Thereafter, the midribs and blades are separated manually by hand, packed into boxes and stored between -5 and -15 °C. Traditionally, fresh wakame seaweed is processed into simply suboshi wakame wherein the pieces are dried under the sun or a hot air dryer. however, this product often fades by active enzymes during storage. To avoid this, its leaf blades processed into haiboshi wakame wherein the fresh wakame is mixed with ash, spread on the ground for 2–3 days, then placed in a bag in the dark. The high PH of ash inactivates the fucoxanthin pigment producing (brown color) enzymes while retaining chlorophyll pigments and wakame stays brilliant green for a long time. Wakame is a low-claorie and low-fat seafood. It holds just 45 calories per 100 grams, slightly more than that of nori (35 calories). Wakame seaweed is rich in minerals, anti-oxidants, omega-3 fatty acids, protein, vitamins and dietary fiber in ample amounts contributing to overall health and wellness. Wakame composes algae polysaccharides (alginic acid), pigments and trace elements which may have anticancer properties. These compounds have been known to possess antiviral activities and work to help maintaining cardiovascular health. 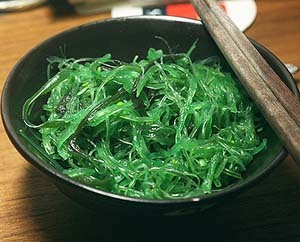 Wakame sporophyll contains a high content of bioactive sulfated polysaccharide, fucoidan. Fucoidan is believed to have antioxidant, anti-viral properties, in addition to being effective in the prevention of some cancers. Wakame products contain appreciable amounts of essential trace elements such as iodine, iron, copper, cobalt, selenium, nickel and zinc, similar to nori and kombu. Wakame is very nutritious seaweeds with easily-digestible and bio-available protein and minerals. In the traditional Japanese medicine, wakame is recognised as "food and medicine combined in one". Its daily consumption is believed to purify the blood. Unlike nori, wakame seaweed consists only a moderate amounts of vitamin-A. 100 g of wakame contains 360 IU or 12 % of daily recommeneded levels of vitamin-A. Vitamin-A is essential for mucosal health and integrity of cell membranes. It is also required by the special cells (rods) in the retina for night vision. Consumption of natural vegetables and fruits rich in vitamin-A and flavonoids are also known to help the body protect from lung and oral cancers. Wakame is an excellent source of B-complex vitamins such as folates-49%, riboflavin-19%, niacin-10%, thiamin-5% of daily allowance (DA). Sufficient folates in the diet may help prevent neural tube defects in the newborns. Unlike in nori, wakame consists of very small amounts (5 mg or 8% of daily recommended levels) of vitamin-C. Vitamin-C is a water-soluble antioxidant which helps in the boosting of immunity and equips the human body to combat against infectious agents. Just as in nori, wakame seaweed is also an important sea-vegetable source of EPA (0.186 g/100 g of 20:5 n-3, Eicosapantonoic acid), a omega-3 fatty acid. In Korean seashore markets, one can buy fresh brown-algae in the season. Oftentimes, it is the dried wakame which is sold in the grocery stores. If you choose fresh wakame, look for healthy looking brown algae that are free from dirt and sand. Ready to use, dehydrated or dried wakame flakes in air-tight packs are available in the USA stores and supermarkets all around the year. Most of the dehydrated products are of the traditional type, such as Su-boshi (dried under the sun without ash treatment) and Hai-boshi (ash treated) wakame. Haiboshi wakame can keeps its brilliant green hue and nice fragrnce which may last for a couple of months when stored in the closed containers at room tepetarture. Buy flake/powder in air-seal packs. Note for the authenticity and date of packing. At home, store wakame in cool, dry place away from moisture and humidity. Keep wakame flakes and powder in sealed containers. Fresh and rehydrated wakame seaweeds are edible raw. To rehydrate, soak dry wakame flakes in hot water for 10-15 minutes till it softens, remove and again dip in cold water. Squeeze to remove excess salt content. Slice as you desire it in recipes. It is often cooked ( for a few minutes). It is used in the soup, salad and marinades. It works well with rice, pasta dishes, vegetable, tofu, meat, poultry, fish and seafood. In South Korea, where it is called as miyeoak (미역) or sea-mustard, wakame is one of the most popular seaweeds consumed. Traditionally, it is prepared in soups (miyeok-guk) to feed mothers soon after the birth of the baby. Miyeok muchim (미역무침, wakame salad) is a delicious side dish in the Korean penninsula. 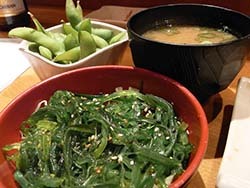 In Japan, rehdrated wakame used liberally in the preparation of miso soup, and cucumber vinegar salad (sunomono). Like other marine produce, wakame seaweed carries relatively higher concentrations of sodium, other minerals, trace elements and heavy metals. Moderate conumption of wakame (not more than 10 grams per day) offers several health benefits such as omega-3 fatty acids, which otherwise not found in many plant-based diets. (Medical disclaimer). <<-Back to Edible Seaweeds from Wakame seaweed. Visit here for an impressive list of seaweeds with complete illustrations of their nutrition facts and health benefits. Fisheries and Aquaculture Department-Undaria pinnatifida. Cultured Aquatic Species Information Programme, Porphyra spp. PDF.